The assembly, growth, and state of visible matter in cosmic structures are largely driven by violent processes that produce and disperse large amounts of energy and metals into the surrounding medium. In galaxies at least as massive as the Milky Way, the relevant baryonic component is heated and ionized to X-ray temperatures. Only Lynx will be capable of mapping this hot gas around galaxies and in the Cosmic Web. It is also uniquely capable of characterizing in all significant modes of energy feedback in unprecedented detail. Essential observations will require high-resolution spectroscopy (R ∼ 5,000) of background active galactic nuclei (AGN), the ability to detect low surface brightness continuum emission, and R ∼ 2,000 spectroscopy of extended sources on arcsecond scales—all unique to Lynx. 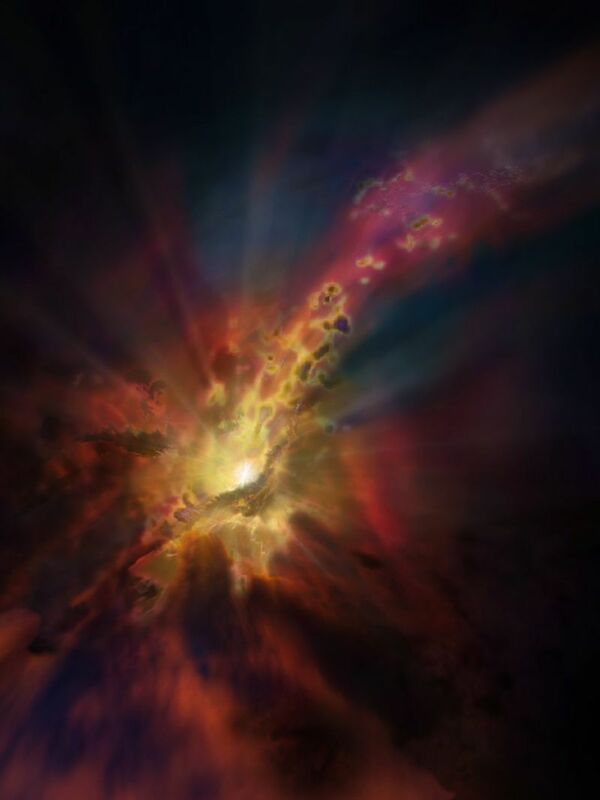 The thermodynamic state, chemical composition, and spatial structure of hot gas in a galaxy's halo encodes the history of its assembly and evolution amid energetic feedback from star formation and black hole growth. Lynx will probe the hot circumgalactic medium (CGM) of Milky-Way-mass galaxies close to their virial radius via direct imaging in emission and gratings spectroscopy in absorption against background quasars, which serve as bright "backlights". We must observe the X-ray signal from these hot gaseous halos in both emission and absorption. The emsision is incredibly faint, so detection requires the Lynx throughput, and its ability to remove background point sources. The structure of absorption lines, meanwhile, is incredibly complex. To make sense of what we see in absorption, we need the spectral resolution only provided by the Lynx gratings. A complex spider's web of filaments spans the gulf of our Universe. Within these filaments, baryons - the building blocks of the luminous Cosmos - contain a fossil record of energetic feedback and the material ejected from galaxies. These ejecta should be millions of degrees, and primarily emit in X-rays. This signal, however, is incredibly faint, and impossible to map with any facility other than Lynx. Modern facilities have thus far only scratched the surface, with detections of ultraviolet and X-ray absorption signatures along single sight-lines. The image at left shows a simulated ten square degree field surveyed by Lynx with 10 megasecond depth. Energetic feedback on galaxy scales essentially comes in two flavors: winds driven by supernovae and stellar birth, and fountains "pumped" by supermassive black holes. Lynx will obtain the most detailed picture of these fundamental processes in action. Lynx will resolve galaxy-scale winds at physical resolutions that range from hundreds of parsecs to tens of kiloparsecs, depending on target distance. The Lynx X-ray Microcalorimeter will map the spatially resolved velocity structure of these winds at 0.3 eV spectral resolution, resolving velocity structures down to a few tens of km/s. Indeed, Lynx creates multidimensional data cubes, wherein every imaging pixel is also a time-resolved spectrum. It's not just an X-ray telescope. It's an X-ray machine for galaxies. On the smallest scales, Lynx will track the hot interstellar medium in the active star forming regions in the Milky Way and nearby galaxies. A combination of X-ray, infrared, and optical data will expose the hot ISM interacting with surrounding dense molecular clouds. That's the energy feedback from stars locally shutting down new star formation. Lynx will map many facets of black hole feedback. It will resolve extended, narrow emission line regions and AGN-inflated bubbles to map the energy generated and dissipated on galactic scales. Because of its hyper-fine angular resolution, Lynx will directly observe gas around the black hole sphere of influence, enabling an entirely new understanding of the "supply side" of feedback and black hole growth. These are among the largest bubbles in the Universe. You could fit a few hundred Milky Way galaxies in each of these giant, buoyantly rising voids of hot X-ray gas, mapped by Chandra in blue. Jets of plasma launched by the central supermassive black hole inflate these bubbles, which act as calorimeters for the black hole's total kinetic energy input. In this case, those jets have imparted about one trillion trillion atomic bombs per second worth of energy into the X-ray atmosphere. Lynx will bear witness to the most energetic events in the Universe. Black holes play musical notes. In addition to inflating buoyant cavities, black holes can drive sound waves in the ambient hot gas. Perseus, for example, is ringing with on of the lowest known musical notes in the universe, 57 octaves below Middle C.
This composite view of the active galaxy Markarian 573 combines X-ray data (blue) from Chandra X-ray and radio observations (purple) from the Karl G. Jansky Very Large Array in New Mexico with a visible light image (gold) from the Hubble Space Telescope. 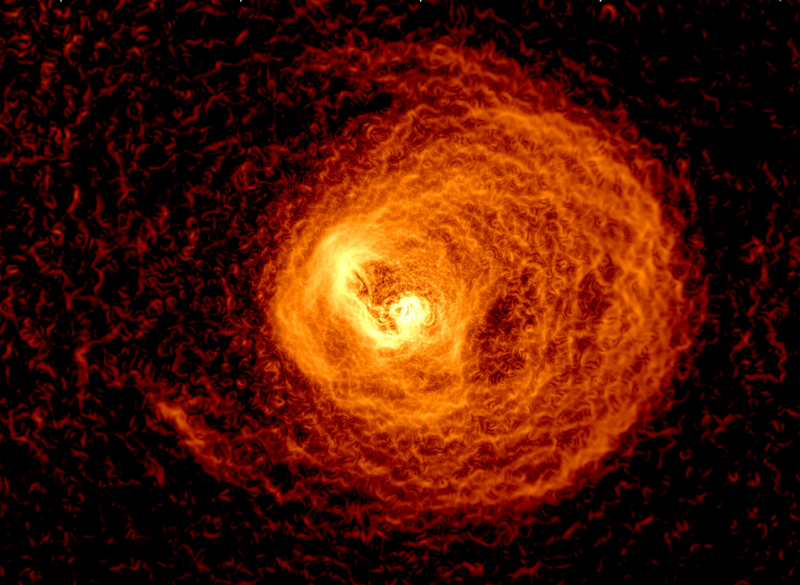 Chandra observation of the Centaurus Cluster, a nearby X-ray cool core. An edge-detection filter has been applied, showing surface brightness discontinuities in the data. These structures have been sculpted by sloshing gas and feedback from the central supermassive black hole. Chandra observations of cool cores in the nearby galaxy clusters show that the dissipation of energy from AGN outbursts in the intracluster medium is a remarkably complex process, where plasma microphysics (e.g., viscosity, dissipation of turbulence, and heat conduction) plays a major role. Hitomi observations of the Perseus provide a glimpse of the power of high resolution spectroscopy, even with coarse angular resolution, for these studies. The X-ray Astronomy Recovery Mission (XARM) and then Athena will bring the X-ray spectroscopic capabilities to the next level and will provide superb measurements of the total energy of gas motions in a large sample of galaxy clusters. However, as the Chandra experience convincingly shows, the key to better understanding the microphysics of AGN energy dissipation lies in the ability to resolve structures down to the Spitzer mean free path scale. Chandra is often limited by statistics, not angular resolution, in probing gas on these scales. Lynx will eliminate this problem. More importantly, it will provide gas velocities on a similar angular scale, providing a third dimension to the data. New handles on the plasma physics effects provided by Lynx observations of nearby galaxy clusters will be used to inform the “subgrid” treatment of the AGN feedback in numerical models of galaxy formation. Lynx's unrivaled angular resolution will be sufficient to determine the gas state at or near the sphere of influence of supermassive black holes in nearby galaxies. While it is likely that the accretion flow within this radius significantly deviates from the Bondi solution, the estimate can still serve as a useful proxy for the instantaneous accretion rate on the black hole. The efficiency factor cannot be determined from first principles, and can be uncertain by approximately an order of magnitude, with the correspondingly uncertain consequences for predictions of the AGN feedback effect on galaxies. Dramatically better sensitivity and new spectral gas diagnostics available with Lynx will make it possible to derive the Bondi rate far more reliably, and in a larger sample of galaxies. These observations will be used to guide subgrid parameterizations of the AGN feedback in numerical models.